Of particular interest are the lab requirements- 11 in all- that will form the basis for selecting the eventual lab design from the many ideas described throughout the talks. If you are only interested in the discussion about the lab itself, you can fast forward to about 35:50. That section presents an example lab and describes the types of things that the candidate would have to perform in the hands-on portion of the exam. 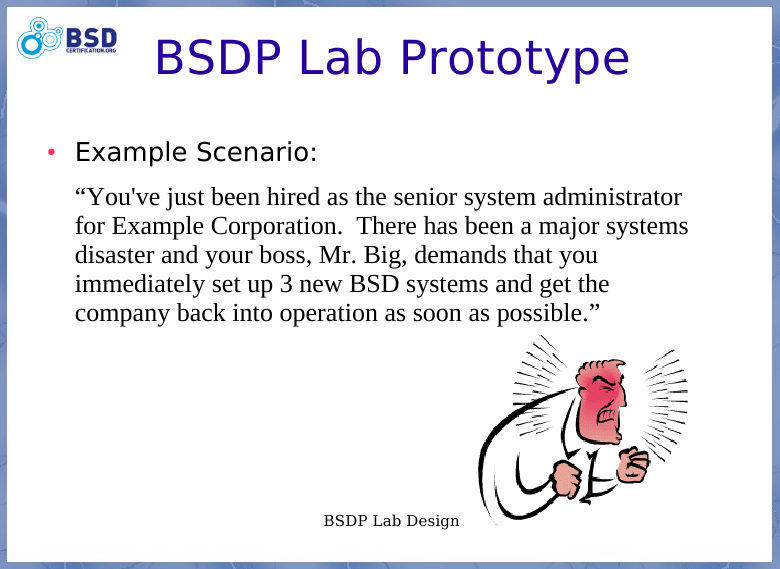 The actual lab tasks are drawn from today's news- a disaster has hit Example Corporation, and your boss Mr. Big, wants you to get things working again, using new 3 new BSD systems. There are specific requirements for filesystem layouts, network connectivity, and DNS. A description of an example lab virtual environment is also shown. Be sure to check out the live demonstration after the talk. The demonstration, though different from what is described in the talk, shows how four virtual machines can be set up in a high availability firewall environment, using two OpenBSD guest virtual machines, a DragonFly guest system, and a FreeBSD guest system. In the demo, the DFly and FreeBSD hosts (external and internal hosts respectively) exchange data seamlessly through the OpenBSD CARP and pfsync interfaces, just as they would in a real world physical environment. 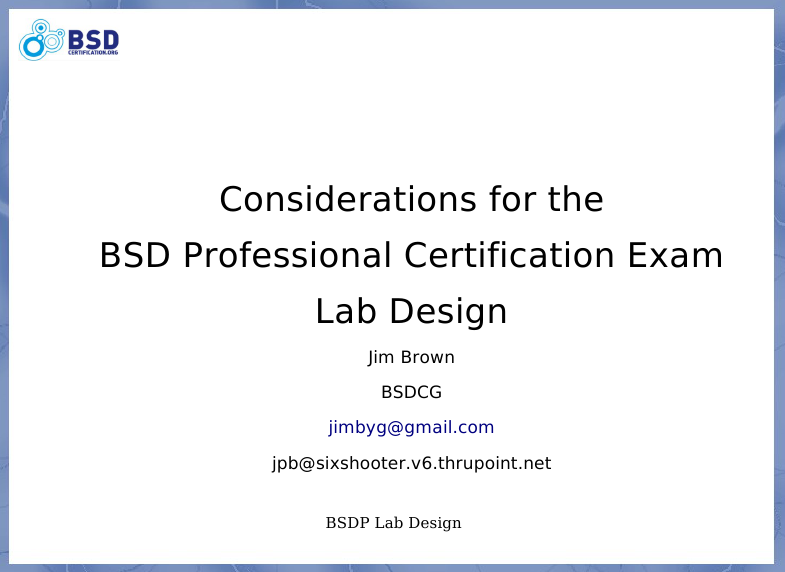 Even more news about the BSD Professional Exam is coming up, including how you can contribute. Stay tuned!